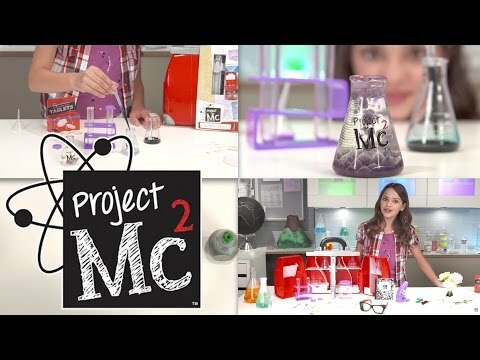 By using the Project Mc2 Ultimate Lab Kit, your little girl can work on different experiments and find answers just like the characters on Project Mc2. Project Mc2 features McKeyla and other science dolls who love to solve missions by using their science and other skills. They work as spies for an organization known as NOV8 and this series is an extremely popular one on Netflix. Kids and parents alike love that these characters foster a love of science and other subjects. (Amazon) features a large lab bag that has everything they need to find answers to the experiments they’ll do. The bag is handy and large enough to keep all the pieces in one place. The lab kit uses learning based on S.T.E.A.M. which stands for Science, Technology, Engineering, Art and Math. By exploring interests in different learning toys and science stuff for kids, they’ll learn how to strengthen analytical thinking skills. With all of the different components in the Mc2 toys lab kit, kids can do multiple science experiments at home. It even includes a 4x power microscope that really works. When they’ve conducted all the experiments that come included in the kit, they can log onto the ProjectMc2 site and download more. , they are simply irresistible! This kid science kit is suitable for girls who are 6 and older and is packed with plenty of pieces that a child can use. It comes with 3 glass slides that kids can use to examine things using the microscope. There are two test tubes for examining liquids and a stand to keep these tubes upright is also included. There’s a funnel with the kit so pouring liquid from one container into another is mess free. A beaker jar comes in the lab kit along with 3 lab flasks. The 15 pH strips that are in the kit can be used to test the pH level for a variety of things inside and outside the home. A pipette dropper is in the box that kids can use when they only need to use a few drops of a substance. There is a petri dish that can be used for studying a variety of cells and organisms. Since safety is important when conduction experiments, a pair of safety goggles do come in the kit. Kids love the experiment kits accessories, especially the Project Mc2 rings and sticker sheets. The kit can be used to complete 15 chemistry experiments, many of them with stuff you have around the house by using the experiment book that’s included. Once kids finish doing all the experiments listed, they can search the Project Mc2 site for more simple science projects.